Since the 1990s, the world seems to have gained an embryo of environmental consciousness. These were the times of Al Gore and the results of studies looking at the Chernobyl case finally published nearly ten years after the catastrophe. Since then, it was impossible for us to close our eyes and answer "I didn't know". The 1990s were also the golden age of Monsanto, Bayer, Dow Chemical Company or Syngenta with genetically modified products and the cheerful use of chemicals. If you add to this scheme, environmental disturbances such as the rising of the sea or the rising of temperatures in some places in the world, you get an explosive situation, a super Molotov cocktail, and a high-scaled disaster. A disaster is: “an event involving a combination of a potentially destructive agent(s) from the natural and/or technological environment and a population in a socially and technologically produced condition of environmental vulnerability." According to Anthony Oliver-Smith in his article "Anthropological Research on Hazards and Disasters" published in October 1996. He continues saying that the only way to respond to a disaster is a "behavioral response approach", with a "social change approach" and with "a political/environmental approach". Without these three perspectives, a response would be superficial and artificial. The situation in the municipalities of Almere and Huizen in the Netherlands fits into this definition and fits particularly well in the description of the world in the 1990s slowly waking up from its environmental negligence but deeply into a productivist agricultural pattern. Indeed, the economy of the Netherlands holds mainly on energy, tourism but also on the exportation of agricultural and food products. Actually, the Netherlands is one of the biggest exporting countries in the world in this field. We can understand the primordial necessity to keep agriculture at its best and the use of chemicals in order to remain competitive. The farmers did not want to lose their contract with the State, thus in the 1990s, very few had the choice and most of the farmers used chemicals. This repeated use of chemicals at first had great results, the crops were bigger than the previous years and the fields were less damaged. The Netherlands were still at the head of the world’s exportation for food and agricultural products. However, at the edge of the third millennium and in the five first years of 2000, problems started to appear in some municipalities and Almere was the biggest representative of the events. The disaster started at the beginning of the XXIth century in Almere. In 2006 the Gooimeer, a 30km2 lake was closed to the public and it had severe consequences for the local economy. The main reason for this closing was the proliferation of cyanobacteria and as a result, blue-green algae. The fact is that these blue-green algae can be harmful and very dangerous for health. Dozens of dogs died after having been in contact with the contaminated water and several persons were admitted to the hospital after poisonous effects on their body system. According to the municipality of Almere and the inhabitants of the town, it was perceived as a “true disaster” (cf La Voix de l’Est, a newspaper). The Gooimeer was not the only place that was discovered to be polluted but the majority of Almere’s open air water systems were also touched. The bacteria seemed to come from the neighbor village of Huizen, known for its many farms while Almere itself had good wastewater treatment plants. What are the cyanobacteria? Why does it produce blue-green algae and how? What are the effects produced? The cyanobacteria have different names representing the same organism: cyanophytes, blue-green algae, myxophyceaens. These multiple names show the important place these organisms have in the development of biology nowadays, they are studied a lot. In Brazil, more than 50 people have already died from the cyanobacteria after an outbreak in a public water supply in 1996. However, even if the bacteria can be lethal to humans, the disaster resides more in the waste of water zones, in the progressive inaccessibility of certain zone and the death of a whole environment. "Dead zones" are being created to show the world how the cyanobacteria have spread and how it is ruining the coastal areas, killing fishes, birds, and other aquatic vertebrates. The water is transforming itself into a pool of poison in which even a human could not swim. These areas are becoming non-viable. In the Gulf of Mexico, a "dead zone" has been noticed by scientists and was about 20 140 square kilometers long. Almost no life exists beneath the surface of the water. France has been touched a lot by a parallel phenomenon on its west coasts, it was a “red tide”. In 2006, in Bretagne, 50 beaches were closed to the public due to this phenomenon. The putrefaction of algae provoked a high toxicity in the air with the emission of sulfate of hydrogen. The main cause of this disaster is the high rate of nitrate and phosphorus in the rivers going to the sea. These nitrates and phosphorus mainly come from the agriculture and the herbicides/pesticides/fertilizers. In some coastal areas in Bretagne, the rate of chemicals is still too high: 25mg/L whereas it should not be above 10mg/L. This is the conclusion of an official report (22nd of May 2012) Bilan des connaissances scientifiques sur les causes de la prolifération des macro-algues vertes – Application à la situation de la Bretagne et solutions from the French Ministry of Agriculture, pointing out agricultural direct responsibilities. The situation is Northern Europe is even worse than the situation in France and National Geographic Education is pointing out: “The Baltic Sea is home to seven of the world's 10 largest marine dead zones. Increased runoff from agricultural fertilizers and sewage has sped up the eutrophication process. Overfishing of Baltic cod has intensified the problem. Cod eat sprats, a small, herring-like species that eat microscopic zooplankton, which in turn eat algae. Less cod and more sprats mean more algae and less oxygen. The spreading dead zones are starting to reach the cod's deep-water breeding grounds, further endangering the species. Thus, the issue does not only concern countries with the hot weather warming up the waters, the direct reasons here are obvious and are the same as in France: Agriculture drifts. I divided my researches and interviews into two blocks, first I went to the lake which is a few kilometers from the city center of Almere and I came back another time to talk to people who were not in direct contact with the lake in the center of Almere. When I went to the Gooimeer, the wind was quite strong and a dozen people were windsurfing, enjoying the sun at the same time. Me: "Do you know the lake was closed a few years ago? Have you heard about what happened?" Windsurfer 1: "Sure I heard about what happened! You know I’m a surf teacher so I used to come over here quite often and I brought the kids for training. I heard about water pollution and toxicity and stuff and I know we have to take these things seriously but you know, we are not stupid we don’t drink the water obviously we are careful and we take a shower each time after the practice so I found it a bit silly to close the entire area; in fact I think it was more a precaution than anything else." 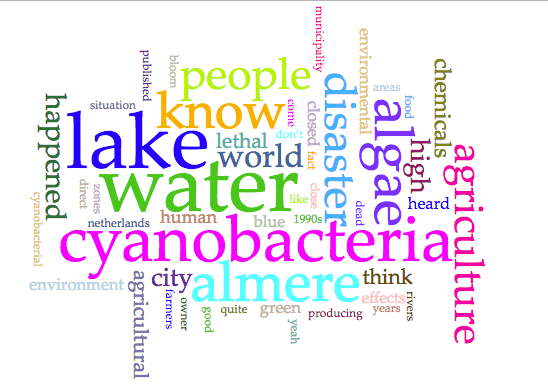 Me: "Did you know there was a water problem in Almere before? Has it surprised you?" Windsurfer 1: "We're talking about all these algae things right? Well, I would say we didn't know there was a "problem" concerning water here, it felt quite the same for us and we were not especially controlling the quality of the water since it's not part of our jobs, this is more the job of the City of Almere to check this or a private enterprise, whatever. But, we did notice the fact that there were more algae yeah. First, it was on the very edge of the lake but it started to spread a little." Me: "Did you question yourself about this growing presence of algae in the lake?" Windsurfer 1: "Yeah not especially to be honest. You know we see these algae more and more everywhere in the rivers or other lakes so we were like, 'it's alright, it is algae, there are algae everywhere, let's surf' (laugh)"
Me: "Do you think this blue/green algae issue should have been more mediatized?" Windsurfer 1: "Honestly, I don’t think so man. I’m living not very far from here and we have heard about it in the newspapers, the lake was closed for many weeks, I mean, it was enough. It was good to protect the lake and protect people from the toxicity and stuff, really it was a good thing to do but to do more and keep talking about it could have frightened the people of Almere or even further. It was a crisis yeah a real crisis and the city was quite upset about it but let’s not generate panic around it. The persons who needed to know about it knew about it and I think it was the main thing. Not everybody is interested in this lake you know." Me: "How did you react to the closure of the lake in 2006 and how did your clients react to this issue?" Owner: "How did I react?! Haha well, I was pretty upset in fact! You know you said to me you work on disasters? Well, for me it was an economic disaster! My income directly comes from this restaurant and indirectly from the frequentation of the lake. If the press and the City decide to close the lake, there are no surfers or tourists and therefore, there are no clients in my place. You see what I mean? During the whole closing thing, my turnover diminished nearly 70%. If it had lasted a couple of months more, I would have been forced to close the restaurant because I did not get any money." Me: "But didn’t you get a financial help from the City of Almere?" Owner: "I did receive some money, yeah but it was nothing compared to the global loss I can assure you." Me: "Scientific studies show that these "water bloom" are very often linked to agriculture and the fact farmers are using too many chemicals that are going into the rivers with the rain. A geographer, Jared Diamond said that: "Agriculture is the worst mistake in the History of the Human race", do you agree with him after being a witness to what happened to the lake here?" Owner: "Hum, I can’t say I disagree completely with him. It is definitely a very extreme statement, maybe too extreme but you know when you see on television how agriculture has deformed our landscapes, when you see how agriculture is producing food that can give you cancer or whatever, when you see how this lake has been polluted, you start to ask yourself some questions yeah. We need agriculture of course, but it’s time to be more careful and to think of the future." Finally, I decided to come back in Almere another day to ask some people in the center of the city, far from the lake, how did they react alongside this disaster. Due to the limit of 3000 words for this work, I cannot reproduce the three interviews I got there, but I choose one that had particularly disconcerted me. Me: "Have you heard about what happened here in 2006 in the Gooimeer?" Lady: "Hum, no I don’t think so, or I can’t remember." Me: "The lake was closed by the municipality due to toxicity provoked by cyanobacteria itself produced by chemicals farmers rejected into the rivers around here." Lady: "No, no, it is strange but I don’t remember, did the newspapers talk about it?" Me: "Yes they did, I found many articles published by De Telegraaf for examples. If you had heard about it, would you be afraid of what happened?" Me: "Can you tell me why especially?" Lady: "Hahaha because I don't care. I never go there, I am safe here and it is none of my business." The first interview seems primordial to me because we can see the discrepancy between people frequenting the lake often, people like windsurfer who know the very core of the lake and people like politicians or people working with the city of Almere. They don’t perceive and feel the lake in the same way. This is not the same interpretation of risk. On the one side, the municipality does not want to take major risks because if someone is admitted to the hospital it will be their fault and if someone tries to sue them because they have not protected the population, they will pay a high price, financially and politically. On the other side, the windsurfer assures us he knows perfectly the lake and that he would not take any risk if there were some. Who should we believe? This is two opposites and the precautionary principle would be to follow the municipality, a deadly accident would be unforgivable. However, isn’t the municipality exaggerating things when calling this a “disaster”? The second interview shows an intermediary that is someone working nearby the lake but not having direct contact with it. Nature is being a business with the restaurant and even if at his own level the owner seems upset by what happened, on the superior level, when we were talking about agriculture, he agrees that changes need to be done. Thus, he is contradicting himself a little bit and he shows how we can be influenced in our way of speaking if the subject concerns us particularly, here financially. His risk-related actions are influenced by his “habitus” (Bourdieu). The third interview represents a part of the population we cannot forget. Those persons in the 1990s who were not interested at all by environment and the planet, “they” still exist. It is sad to remark that one can live in this world without realizing the balance of the planet is fragile and that issues like cyanobacteria, which could kill someone she knows, are of little importance to her. Cyanobacteria and even Nature is here depicted as a form of “Otherness” (Bauman) since the subject is rejected by fear or lack of knowledge. Since a dozen of years, the effects of cyanobacteria are being studied and environmental responses begin to appear; this disaster of a worldwide scale is attracting media’s attention because it can be easily visible in the landscape. However, what happened in Almere seems to be quite confidential. People there show a diverse interest to the lake but the fault does not seem to come from these persons in the first place but from a more global coverage of the case. Whereas this local disaster could have been a starting point for conversations around agriculture in the Netherlands or around the environment, the subject was buried as quickly as possible in order not to create panic inside the population but also in order not to scare tourists in the city. The lake was closed and the rivers were polluted but nobody was talking about it except people living nearby the lake or living economically through the lake. Today, everybody is pretending and acts as if nothing happened and I am afraid to think that if it would happen again, the result would be the same. When politics are at stake, the environment seems to be even more fragile than it actually is because it is not the priority.